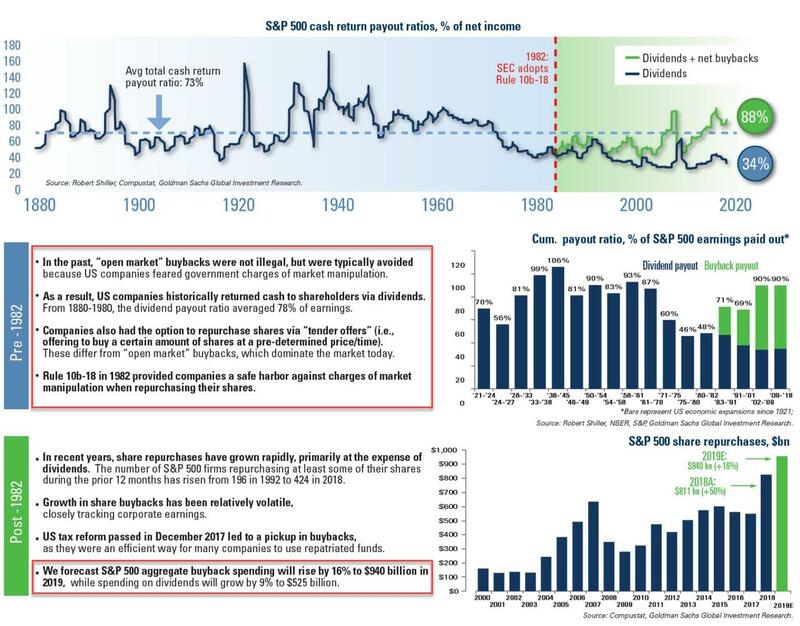 So while it remains to be seen if Congress will ban buybacks, one thing is certain: as Goldman’s David Kostin cautioned last week, without company buybacks, demand for shares would fall dramatically, for one simple reason: repurchases have consistently been the largest source of US equity demand. Since 2010, corporate demand for shares has far exceeded demand from all other investor categories combined. Net buybacks for all US equities averaged $420 billion annually during the past nine years. In contrast, during this period, average annual equity demand from households, mutual funds, pension funds, and foreign investors was less than $10 billion for each category – despite the fact these categories collectively own 83% of corporate equities. Buybacks represented the largest source of equity demand in 2018. This is shown in the table below. 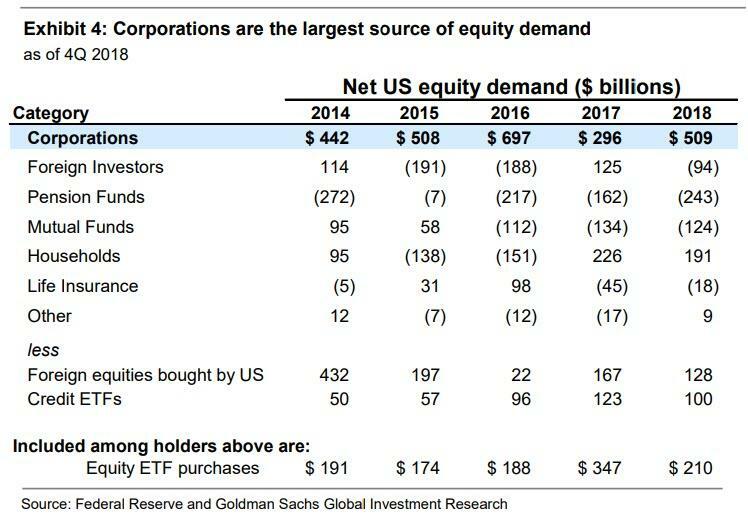 A: US corporates have been the largest net buyers of US equity for the last decade, repurchasing $5tn+ since the financial crisis. Last year, roughly $1.1 trillion of repurchases were authorized, with about $900 billion actually repurchased. As a share of the overall trading footprint, that’s around 6-7% of average composite volume, which might be viewed as a slightly underwhelming number. But companies repurchase stock under rule 10b-18, a safe harbor enacted by the SEC in 1982 to provide companies an affirmative defense against accusations of stock price manipulation. This rule provides volume, timing and price limitations on how companies buy back stock. Pulling out the non-eligible volume, the trading footprint increases to about 10% on average, and into the teens during market weakness. A: There is not a great deal of seasonality. Q1 tends to be the lightest quarter of activity—about 23% of total annual notional— given that companies have the least visibility on what earnings will look like that year. Q2 tends to be a little bit more active at around 24%, while the last two quarters average around 26 to 27%, as companies feel more confident in repurchase levels given greater clarity on earnings strength/cash flow generation in the second half of the year. A: No. The other rule relevant to share repurchase programs is 10b5-1. The SEC enacted this rule in 2000 to provide senior executives, who have a desire to sell equity, an affirmative defense to any charge of insider trading, by adopting a written plan to sell at a time when they are not in possession of material non-public information (MNPI). The plan is a written contract between the individual and their broker, and contains very specific instructions on trade dates, sale parameters, etc. Though the plan may extend through a blackout window when the individual possesses MNPI, because it’s ultimately on auto-pilot, the executive is protected. Companies have applied this same safe harbor to buyback programs, enacting plans before the blackout window that will run on auto-pilot during the window. Very little public information is available on 10b5-1s, but an internal analysis of 350 companies suggests that approximately 85% of companies utilize them to continue to purchase stock during closed windows. Companies do tend to be more conservative than in the open window (when they have access to real time information); we observe a notional spend reduction of ~30% during the blackout window.